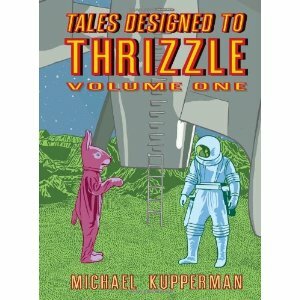 A collection of individual issues, from the comic book of the same name, designed to “thrizzle” the reader, i.e., thrill them into a frenzy of laughter so that they tinkle. Bizarre. Smartly done. Incredibly well crafted. Flat-out funny. Enviable. Einstein and Mark Twain paired as a detective team because of their similar looks? Snake & Bacon paired together because they make a similar Hsssssss sound?? A man whose super power is to become a banister named The Manister??? Yes, yes, a thousand* times yes! This book hasn’t been adapted into a major motion picture. And Mark Twain died before he could read this book. And that print media is a slowly dying artform. Buy. Now. Definitely lives up to its premise: Thrizzling from start to finish! I almost** want to suffer amnesia so that I can experience this book again as though it were the first time. *Actually, probably more like 10-15. I can’t really see myself saying ‘yes’ 1,000 times during a book review. **Selective amnesia, re: this book.